With excellent set ups for the qualitative production and the implement of advance manufacturing techniques, we successfully provide the FIFO-first-in-first-out racks of best quality. 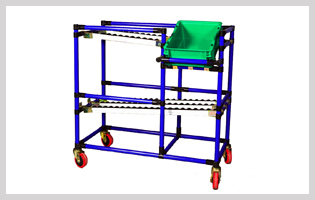 We are tagged as the FIFO rack manufacturer, offering extensive storage capacity. The pallets are loaded at one end and pushed back to the other end. They are then placed at the front of the row on the opposite side. First placed pallet of the row is also first picked pallet at the other end. These first-in-first-out racks are demanded for the products containing value for the expiry dates. Food and beverages and pharmaceutical products are not being used after expiry dates. So, these FIFO racks manage efficiently the products according to their date and time of manufacturing. So it is used in storage and ware houses of food as well as medicines. The flow rails and roller channels are attached with the shelves of assembly line. It operates by gravity. No electricity is used for the channels.